Oscar Pistorius To Be Released On Bail As He Awaits Sentencing : The Two-Way An appeals court found Pistorius guilty of murdering his girlfriend Reeva Steenkamp. While he awaits sentencing, Pistorius will be under house arrest. 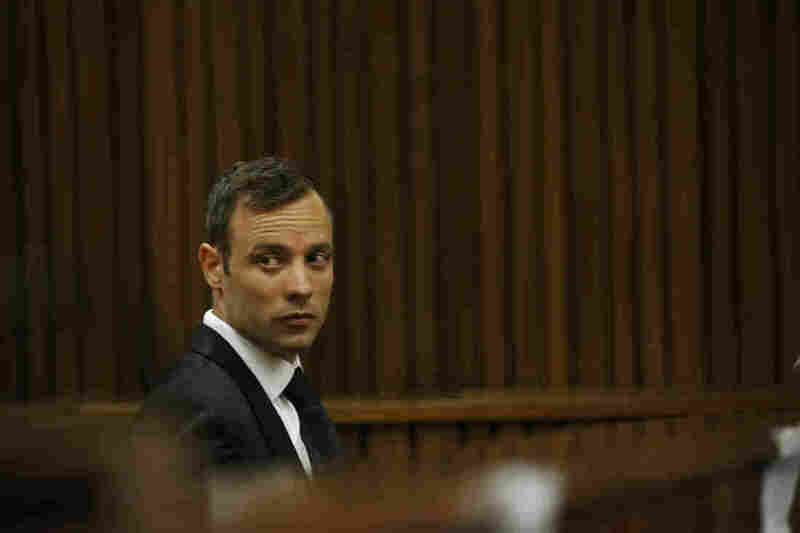 Oscar Pistorius sits in the dock at a courtroom of the North Gauteng High Court in Pretoria, South Africa, on Tuesday. Oscar Pistorius, the double-amputee sprinter who came to be known as the "Blade Runner," will be released on bail while he awaits his sentence over the murder of his girlfriend Reeva Steenkamp. Pistorius' legal battle has been long: Last year, a lower court convicted Pistorius of a lesser charge and sentenced him to five years in jail. Earlier this month, however, an appeals court ruled that he should have been found guilty of murder, instead. That charge, as we've reported, carries a minimum sentence of 15 years in prison. "Deputy judge president Audrey Ledwaba granted bail of R10,000 [$692] on condition that Pistorius remains under house arrest. 'He has proved that he is not a flight risk,' the judge said. "Pistorius, was present in court, dressed in a dark suit and tie, remaining calm and composed throughout, and occasionally sharing a joke with his lawyers. Before court began, he had agreed to the strict conditions of his house arrest, which mostly confine him to Arnold Pistorius's mansion in Pretoria." "Defense lawyer Roux also said Pistorius plans to appeal his conviction to the country's Constitutional Court. "He added: 'This is a serious offense ... that is why we think and we think there should be serious bail conditions.' "